Barbados is a small Caribbean Island located north of Venezuela, only 34 kilometers (21 mi) long and 23 km (14 miles) wide. Over one fourth of the entire population of 284,000 live in the capital, Bridgetown. The West Coast of the island is where most of the luxury resorts are located. 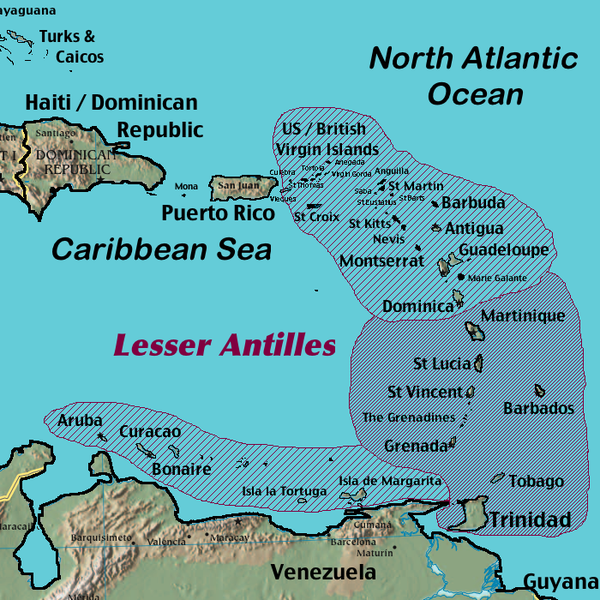 Neighboring Caribbean Islands are Saint Vincent and the Grenadines to the west and Trinidad and Tobago in the south. Barbados is one of the most diverse Caribbean Islands, offering high-end luxury accommodation and budget guest houses, plus tour operators offer affordable trips to Barbados from as far as Europe. Even though the Caribbean paradise is such a popular tourist destination, the island never feels packed, maintaining laid-back island vibe and famous calypso rhymes away from the big holiday resorts. The island has much more to offer than its picture-perfect Caribbean beaches (though those don’t hurt!). Central Barbados is made up of a rolling terrain of limestone hills covered in lush green scenery that can be taken in from various viewpoints. You can still see plantation homes of the island’s first colonial settlers. The Atlantic coast on the east side of the island is a famous place for surfers, but you can also pursue other water sports such as wind surfing or kayaking there. Another top spot for surfers is Silver Sands in the South of the island. No visit to Barbados is complete without sampling some local rum. The best place to do this is in the Mount Gay Rum Distillery near Bridgetown, where you can take a 45-minute tour of the distillery and learn all about rum-making – and taste some, of course! Barbados is a great spot for diving, offering a vast underwater life with colorful tropical fish, coral reefs and sunken ships. If you are not a diver, we recommend taking a snorkeling tour which allows you to snorkel in some of the clearest waters in the Caribbean, and includes swimming above a shipwreck and guarantees sea turtle spottings. Barbados has a beautiful Botanical Garden in which it preserves the unique exotic plants that grow on the island – a wider range than most countries on this planet have to offer! The over 375 year-old capital is a truly Caribbean experience with it colorful houses, some of which date back to the 16th century! Make sure to stroll along the waterfront where you can marvel at the exceptional yachts and the small boats of the local fishermen. You can take a Segway Tour of the northern coast, which will take you to the spectacular countryside. different and unique way to explore the island! Experiencing a West Indies cricket game in the capital is one of the most authentic Barbados experiences to be had. If you are interested in getting to know the culture of the island, you should check if there is a cricket game on while you are there.